The kiwi, or Chinese gooseberry, is the edible berry of a woody vine in the genus Actinidia. Kiwis can help individuals fight infections because they are loaded with vitamin C.
The kiwi, or Chinese gooseberry, is the edible berry of a woody vine in the genus Actinidia. The name of the berry changed from Chinese gooseberry to kiwi because it contains similar characteristics with the New Zealand's national symbol, the kiwi bird, which is also small, brown, and fuzzy. It also has a bright green or golden soft flesh with rows of tiny, black, edible seeds. Other species of Actinidia are native to India, Japan, and southeastern Siberia. This fruit possesses much nutritional value that contributes to many health benefits of eating kiwi, along with it being low in calories. In terms of kiwi nutrition facts, there are only 42 calories and 2.1 grams of fiber. This can help individuals, who want to feel full with very little calorie consumption. The fiber content in kiwi can help the digestive system by reducing constipation, stimulating the release of stomach acids, and enabling smooth muscle movement, causing regular bowel movements. The high dietary fiber content enables kiwi fruits to have a lower glycemic index (GI) value. The GI scores food and drinks based on the potential blood sugar increase that the food can induce. It is beneficial to eat foods with a lower glycemic index value because these foods are less likely to cause any spikes in blood sugar. Foods high on the glycemic index (such as white rice and white bread) will break down easily and can be potentially dangerous to individuals with diabetes. Also, the sugar from kiwi is slowly absorbed into the bloodstream, thus preventing sugar crashes, sugar cravings, and mood swings. Kiwi can also help individuals fight infections. They are loaded with vitamin C, a powerful natural water-soluble antioxidant that helps the body fight against infectious agents and eliminate cancer-causing chemicals in the body. The vitamin C in kiwi can also improve hair and skin condition. Vitamin C is necessary to produce a protein, called collagen, which is essential for the structure of our bodies. Collagen is the framework for our skin and our bones that holds it together. Individuals with hypertension may benefit from kiwi. Kiwi has a high potassium to sodium ratio. One cup of kiwi contains 688 milligrams of potassium, compared to 3.3 milligrams of sodium. High potassium to sodium ratio foods, such as kiwi, can lower the top number on the blood pressure score (systolic blood pressure). Other kiwi benefits include improving bone health due to its high content of vitamin K. Only increasing the consumption of calcium may not be enough to prevent bone diseases. Vitamin K is an essential component of the process, and it helps improve calcium absorption and reduces urinary excretion of calcium. It acts as a modifier of bone matrix proteins and improves bone strength. Kiwi may also improve brain health by maintaining a healthy brain. This furry fruit contains a vitamin called folate. Folate has been known to reduce the rate of Alzheimer’s disease and brain function decline. Also, the rich potassium content of the kiwi has been linked to increased blood flow to the brain, thereby helping improve an individual’s concentration and brain activity. Duttaroy, A. K., & Jørgensen, A. (2004). Effects of kiwi fruit consumption on platelet aggregation and plasma lipids in healthy human volunteers.Platelets, 15(5), 287-292. Lucas, J. S. A., Grimshaw, K. E. C., Collins, K. W. J. O., Warner, J. O., & Hourihane, J. B. (2004). Kiwi fruit is a significant allergen and is associated with differing patterns of reactivity in children and adults. Clinical & Experimental Allergy, 34(7), 1115-1121. Ferguson, A. R., & Ferguson, L. R. (2002, September). Are kiwifruit really good for you?. In V International Symposium on Kiwifruit 610 (pp. 131-138). Collins, B. H., Horská, A., Hotten, P. M., Riddoch, C., & Collins, A. R. (2001). Kiwifruit protects against oxidative DNA damage in human cells and in vitro. Nutrition and cancer, 39(1), 148-153. Rush, E. C., Patel, M., Plank, L. D., & Ferguson, L. R. (2002). Kiwifruit promotes laxation in the elderly. Asia Pacific journal of clinical nutrition,11(2), 164-168. Parkar, S. G., Redgate, E. L., Wibisono, R., Luo, X., Koh, E. T., & Schröder, R. (2010). Gut health benefits of kiwifruit pectins: Comparison with commercial functional polysaccharides. Journal of functional foods, 2(3), 210-218. Tamburrini, M., Cerasuolo, I., Carratore, V., Stanziola, A. A., Zofra, S., Romano, L., ... & Ciardiello, M. A. (2005). 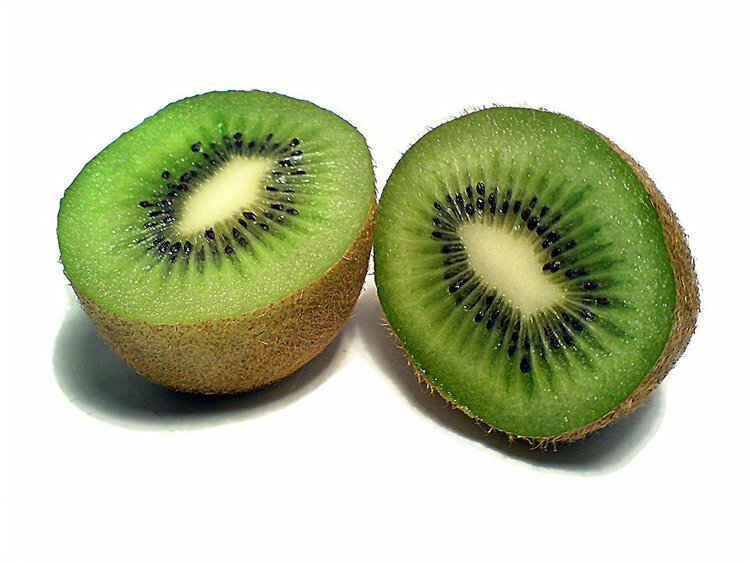 Kiwellin, a novel protein from kiwi fruit. Purification, biochemical characterization and identification as an allergen. The protein journal, 24(7-8), 423-429.